Following continuous success and development of ImmuniWeb web application security testing platform, High-Tech Bridge has been ranked #37 at Cybersecurity 500 among the Top 50 of the most innovative cybersecurity companies to watch in 2015. 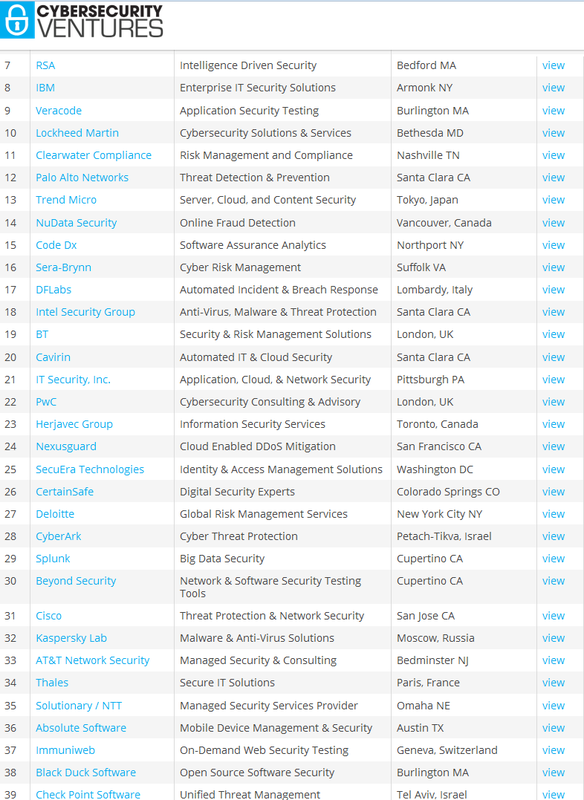 At the beginning of June 2015, information security consultancy High-Tech Bridge has been ranked #65 at Cybersecurity 500, among the Top 100 of the hottest and most innovative cybersecurity companies to watch in 2015 according to Cybersecurity Ventures. Since then, High-Tech Bridge has opened a branch office in San Francisco (CA), and signed a strategic partnership with PricewaterhouseCoopers (PwC) to deliver continuous and on-demand web security testing via ImmuniWeb®. Many new customers, mainly represented by the banking and financial sectors, became repeat clients of ImmuniWeb for their critical web applications and websites. A survey in “The SANS Institute 2015 State of Application Security Report” indicates that public-facing web applications are rated as the major concern by 74 percent of respondents. More than one-quarter — 27 percent — of all security breaches at banks last year involved web app attacks, according to the most recent “Verizon Data Breach Investigations Report”. The market for global corporate web security was sized at over $1.7 billion (USD) in 2014, and is anticipated to reach a value of $3.2 billion by 2020, according to a report from Future Market Insights (FMI). ImmuniWeb web application security service combines managed vulnerability scanning with manual penetration testing performed in parallel by experienced security auditors. Thanks to High-Tech Bridge’s hybrid security testing technology, ImmuniWeb detects the most complex vulnerabilities and guarantees zero false-positives in a manually-written report.